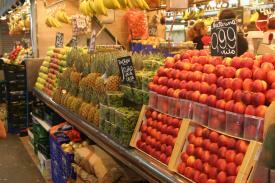 La Rambla and Boqueria Market: Tigger Travels - Family Adventure Journal Photos From Tigger`s Travels and MORE! 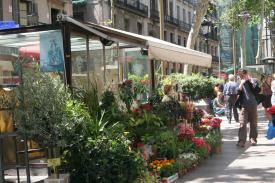 La Rambla is one of the biggest tourist draws in Barcelona. We meandered down the mile long stretch on several occasions stopping at newspaper kiosks, flower stands, restaurants and just taking in the carnival like atmosphere. There were artists and street performers. Some were really good and some were very spooky! Again being crowded and full of tourist we watched our valuables very closely. The Mercat de la Baqueria is located right off La Rambla. This is were David and Val went as our Hunter/Gather's in search of groceries when our local market was closed for the weekend. I went with them later to check it out because is sounded fascinating. This market is in a huge building with individually manned stands.��We started walking around the outskirts where we found open air cafes with the smell of delicious seafood paella throughout. 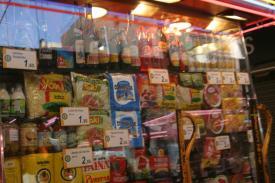 There was also a little grocers that sold, everyday boxed and canned items in this area. The rest of the market was��fresh items. There was fresh produce stands with amazing fruits and vegetables. 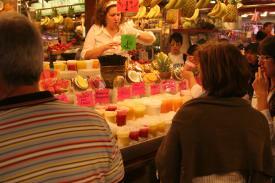 Many of these stands sold fresh fruit smoothies. David and the Kids had Strawberry/Banana smoothies. They were great,��it was basically pureed fruit with a little bit of ice. We saw egg stands and a fish market. There are no additives and preservatives in this food. 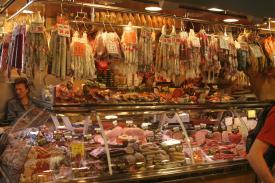 I think one of the most unusual stalls were the butchers area. They had sausages hanging everywhere along with brains, tongue and lots of weird items we don't see in the American grocery store. We went to the butchers area to pick up some fresh ham and cheese for sandwiches. 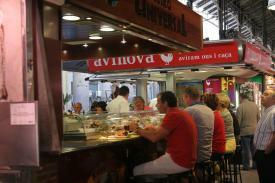 The Tapas stands inside the Boqueria are places to get fresh cured meats with crackers, Mediterranean mix of olives and garlic, omelet dishes and much more. Many of these stands have both take out boxes and eat in but some offer a bar to sit at and you just pick the Tapas you want from the buffet as you want them eat them and drink wine. 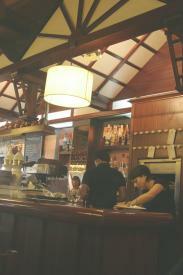 They count the bill by the number of tooth picks or plates you have for example you can get 5 Tapas for 10 Euros. We didn't get the opportunity to eat at the Tapas stand all the seats were taken so we went to one of the cafes instead. As we walked out of the Boqueria, we turned right.��There are three cafes in a row that have similar lunch deals. We went into the third one. In the restaurant we ordered the lunch special were you get a appetizer, meal and desert along with a drink for 9.00 euros. It was quite good. After lunch the server came up and said ok the kids needed after dinner drinks 1 vodka and 1 whiskey coming up. I wasn't to concerned about it when I saw that the shot glasses had carbonated bubbles in it. Of course it was sprite and coke. However the kids thought they were hot stuff.